The Pelagornis is one of the Creatures in ARK: Survival Evolved. The much-larger ancestor of water birds like the stork or pelican, Pelagornis miocaenus shares many traits with its modern-day brethren. However, it seems to spend far more time hunting for fish over the open deep-sea. In fact, I have rarely spotted a wild Pelagornis anywhere near the coasts of the main Island, as it prefers to rest its wings by paddling on the ocean's surface rather than waddling along the Island's beaches. Perhaps this behavior is a result of its survival instincts. The Early Miocene was a post-dinosaur epoch, after all, and Pelagornis would not be accustomed to such predators. Considering how quickly it flees from humans, one can hardly blame its caution. Because of its ability to fly, walk and surface-swim, a tamed Pelagornis is one of the Island's most versatile mounts, but this comes at a cost. The same webbed feet that allow Pelagornis to serenely maneuver along the ocean's surface prevent it from carrying prey off the ground, which may limit its appeal to some survivors. Flying a tamed Pelagornis into the water will cause it to "land", and swim around until you take off again. Wild Pelagornis are naturally shy creatures that will fly away at the first sign of conflict. A relative of modern seagulls, Pelagornis is instantly recognizable from the more common Icthyornis by its size. 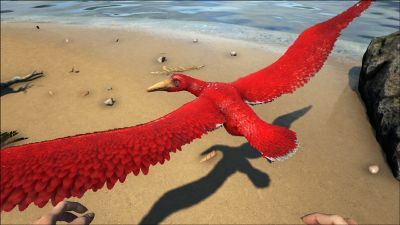 With a wingspan rivaling Argentavis, it also possesses a beak filled with tooth-like projections for snagging fish, as well as webbed feet for paddling upon the ocean surface when it must rest its wings. This section displays the Pelagornis's natural colors and regions. For demonstration, the regions below are colored red over an albino Pelagornis. The colored squares shown underneath each region's description are the colors that the Pelagornis will randomly spawn with to provide an overall range of its natural color scheme. Hover your cursor over a color to display its name and ID. For example, "cheat SetTargetDinoColor 0 6" would color the Pelagornis's "feathers" magenta. 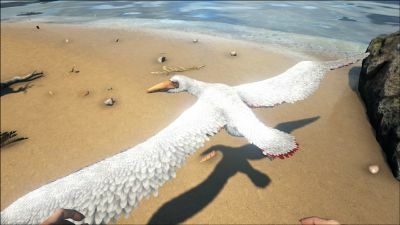 Using the (PC), (PS4), (Xbox One), the Pelagornis bites the target. The Pelagornis deals ten times more damage to Coelacanth, Sabertooth Salmon, and Piranha, and can harvest them with the same attack that killed them. Coelacanth and Salmon can usually be killed in one hit by this, but Piranha have more health and may require two or three hits. The most reliable strategy for downing Pelagornis is to use a regular bow with tranquilizer arrows. Crossbows and Compound Bows may kill them before actually downing them depending on your server settings, the quality of your weapon, and the health of the bird. It is possible to use a bola on them, so if it's walking on the beach, this can be very easy. If you have a low melee level Pteranodon, you can attack the Pelagornis and get it to flee inland, where a tribe mate can use a bola and then you both attack it with Tranq darts. Alternatively you can follow them till they reach land and bola or shoot them so they can knock out over land. Another strategy is to get a Raft directly under the flying Pelagornis, so there is a chance that they land on your raft and you can easily bola them and knock them out. Or you can try to bola them while flying over your raft. One additional strategy is to use a grappling hook when over land, thus not allowing the Pelagornis to fly away and making the KO very easy. This section describes how to fight against the Pelagornis. Due to their skittish temperament, they'll fly away when attacked. When a wild Pelagornis is attacked it will fly away. Use a bola to hold it in place to knock it out or kill it easier. Use ranged weapon and aim at head, due to their low health, it should be dead after one shot. While the Pelagornis itself does not usually pose a threat, they will fly away when attacked, so a player more concentrated with killing or taming one than watching their surroundings may find themselves ambushed by a pack of Raptors or other hungry carnivores nearby, so it is best to quickly scout around the area before going in for the kill/tame. They have very little health. Last Hit Collector: Pelagornis is a great creature for trying to get the last hit on prey, due to its exclusive ability to kill and harvest a creature in a single attack. Circle around a fight of predators and wait for one of them to get bloodied, then swoop in to finish it off. This allows players to farm Meat or Hide without coming near enough to get damaged. However, the Pelagornis can not gather prime meat with this ability, so its utility is limited. Level up weight and melee. Oceanic Kick-Starter: When on water, Pelagornis lands safely and becomes a fast swimmer. This can save your life if your Pelagornis happens to get low on Stamina, but in swimming mode, Pelagornis will attract water creatures, which can make Megalodon your next problem but can also help with taming Ichthyosaurus. They will swim up to the Pelagornis, and can be either tamed on the spot or lead to a safer enclosed area, with the added bonus of being able to fly away should sea predators appear. To early players, this can be a helpful kick-start to establishing an oceanic presence. However, the high saddle level means that players may no longer have need of this utility once they are able to ride their Pelagornis. Organic Polymer Farmer: Can be used to fly to the tundra and eat penguins, harvesting organic polymer from them. Note that younger penguins give substantially more polymer, so target the babies first, as all penguins will run as soon as you start attacking. Level up weight and melee. Polymer is heavy, and the Pelagornis' base weight is very low. Fish Killer: The Pelagornis gets a massive attack bonus against Piranhas, Sabertooth salmon, and Coels. It will easily kill and harvest fish meat from them in one shot, usually killing multiple Piranhas in one hit as they tend to swarm as soon as you land on the water. Note that the bonus damage does not apply to mantas or other sea creatures. Long Distance Scout: Pelagornis get a 36.5% boost to flying speed when they are tamed, and have fairly good base stamina. Combined with their ability to land nearly anywhere to regain their stamina, this makes them an excellent long haul scout that can either out fly or out last someone trying to chase it down. Level stamina. Fishing Platform: Players can fish while on a Pelagornis, and it can fly to easily reach a favorite fishing location. Furthermore, if predators approach the Pelagornis, it can fly away to safety and to another fishing spot. Level up health and weight. Won't eat raw meat. Only Fish. Pelagornis will throw you off his back if you're flying over lava. Be careful! You can place a raft while riding on a Pelagornis. The dossier was revealed on 05/30/16. The Pelagornis miocaenus is the same name as the type species of genus Pelagornis, the genus name means 'miocene' in Latin. With a wingspan of around 6 m (18 ft), Pelagornis was one of the longest wingspan flying birds in history (Argentavis could have been bigger, but its wingspan is unknown). The Pelagornis fits through an opened doorway, and unridden stands under ceilings 1 wall high (except when a sloped ceiling is used over the doorway). It can thus go anywhere inside a base that is ramp accessible. This page was last edited on 14 April 2019, at 16:40.